At first glance, the park that bisects the Brandywine Hundred communities of Devon and Devonshire is little more than a small stand of trees split by a meandering creek and walking path. For neighbors however, it's become something of a headache. Flooding, signage, littering and loitering were just some of the topics residents discussed with county officials at a meeting at the park Monday afternoon. It wasn't an angry bunch, just a group of newly engaged citizens grateful for a chance to get face time with park workers and police officers who pledged to help them make the park into a community asset again. Even before the meeting, which was organized by Councilman Robert Weiner (R-Chatham), park crews removed debris from the creek that was causing flooding issues for the parks most immediate neighbors. And Paul Johnson, who oversees park maintenance for the county, also committed to filling some holes along the pathway where water puddles after rainstorms. Meanwhile, County Police Cpl. Amy Kevis implored residents to be proactive in phoning in complaints about loitering and late-night partying by teenagers in the park's south end, where Devonshire Civic Association President Maria Masington pointed out empty beer cans and liquor bottles littering the ground near the Coulter Court entrance to the park. Kevis also said she'd have officers increase patrols there on Friday and Saturday nights. Installing "No Loitering" signs was also discussed. "There are some people who are afraid to come down here," Masington said. Meanwhile Scot Savitch, President of the Devon Civic Association, said he'd like to see benches installed. "We've got some older people who may walk all the way from one end of the neighborhood to use the park and would like to have some place to sit and rest and relax," Savitch said. Weiner said the county may not have the money for benches in its current capital budget, but he said putting together a wish-list was an important first-step in getting residents to buy-in to the park as a community asset. 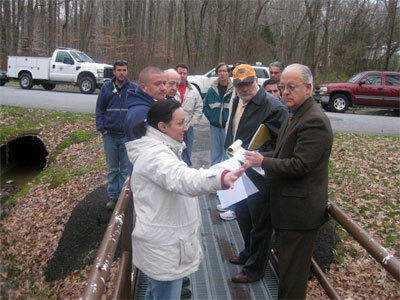 To report maintenance issues in New Castle County parks, email parksrequest@nccde.org. For criminal complaints, call the NCCo Police non-emergency number at 302-573-2800 or email Cpl. Amy Kevis at akevis@nccde.org. Residents of Devon and Devonshire meet in the park that sits in the heart of their Brandywine Hundred communities to discuss maintenance issues with Councilman Bob Weiner and New Castle County park workers.